In geology and geophysics, thermal subsidence is a mechanism of subsidence in which conductive cooling of the mantle thickens the lithosphere and causes it to decrease in elevation. This is because of thermal contraction: as mantle material cools and becomes part of the mechanically rigid lithosphere, it becomes more dense than the surrounding material. Additional material added to the lithosphere thickens it and further causes a buoyant decrease in the elevation of the lithosphere. This creates accommodation space into which sediments can deposit, forming a sedimentary basin. Subsidence is the sudden sinking or gradual downward settling of the ground's surface with little or no horizontal motion. The definition of subsidence is not restricted by the rate, magnitude, or area involved in the downward movement. It may be caused by natural processes or by human activities. The former include various karst phenomena, thawing of permafrost, consolidation, oxidation of organic soils, slow crustal warping, normal faulting, caldera subsidence, or withdrawal of fluid lava from beneath a solid crust. The human activities include sub-surface mining or extraction of underground fluids, e. g. petroleum, natural gas, or groundwater. Ground subsidence is of global concern to geologists, geotechnical engineers, surveyors, engineers, urban planners, landowners, and the public in general. In physics, buoyancy or upthrust, is an upward force exerted by a fluid that opposes the weight of an immersed object. In a column of fluid, pressure increases with depth as a result of the weight of the overlying fluid. Thus the pressure at the bottom of a column of fluid is greater than at the top of the column. Similarly, the pressure at the bottom of an object submerged in a fluid is greater than at the top of the object. The pressure difference results in a net upward force on the object. The magnitude of the force is proportional to the pressure difference, and is equivalent to the weight of the fluid that would otherwise occupy the volume of the object, i.e. the displaced fluid. Isostasy is the state of gravitational equilibrium between Earth's crust and mantle such that the crust "floats" at an elevation that depends on its thickness and density. Sedimentary basins are regions of Earth of long-term subsidence creating accommodation space for infilling by sediments. The subsidence can result from a variety of causes that include: the thinning of underlying crust, sedimentary, volcanic, and tectonic loading, and changes in the thickness or density of adjacent lithosphere. Sedimentary basins occur in diverse geological settings usually associated with plate tectonic activity. Basins are classified structurally in various ways, with a primary classifications distinguishing among basins formed in various plate tectonic regime, the proximity of the basin to the active plate margins, and whether oceanic, continental or transitional crust underlies the basin. Basins formed in different plate tectonic regimes vary in their preservation potential. 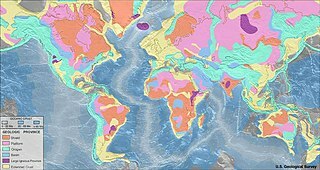 On oceanic crust, basins are likely to be subducted, while marginal continental basins may be partially preserved, and intracratonic basins have a high probability of preservation. As the sediments are buried, they are subjected to increasing pressure and begin the process of lithification. 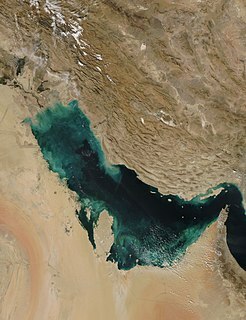 A number of basins formed in extensional settings can undergo inversion which has accounted for a number of the economically viable oil reserves on earth which were formerly basins. Ridge push or sliding plate force is a proposed driving force for plate motion in plate tectonics that occurs at mid-ocean ridges as the result of the rigid lithosphere sliding down the hot, raised asthenosphere below mid-ocean ridges. Although it is called ridge push, the term is somewhat misleading; it is actually a body force that acts throughout an ocean plate, not just at the ridge, as a result of gravitational pull. The name comes from earlier models of plate tectonics in which ridge push was primarily ascribed to upwelling magma at mid-ocean ridges pushing or wedging the plates apart. Back-stripping is a geophysical analysis technique used on sedimentary rock sequences - the technique is used to quantitatively estimate the depth that the basement would be in the absence of sediment and water loading. This depth provides a measure of the unknown tectonic driving forces that are responsible for basin formation. By comparing backstripped curves to theoretical curves for basin subsidence and uplift it is possible to deduce information on the basin forming mechanisms. The rock cycle is a basic concept in geology that describes the time-consuming transitions through geologic time among the three main rock types: sedimentary, metamorphic, and igneous. As the adjacent diagram illustrates, each of the types of rocks is altered or destroyed when it is forced out of its equilibrium conditions. An igneous rock such as basalt may break down and dissolve when exposed to the atmosphere, or melt as it is subducted under a continent. Due to the driving forces of the rock cycle, plate tectonics and the water cycle, rocks do not remain in equilibrium and are forced to change as they encounter new environments. The rock cycle is an illustration that explains how the three rock types are related to each other, and how processes change from one type to another over time. This cyclical aspect makes rock change a geologic cycle and, on planets containing life, a biogeochemical cycle. A cratonic sequence is a very large-scale lithostratographic sequence that covers a complete marine transgressive-regressive cycle across a craton. They are also known as "megasequences", "stratigraphic sequences", "sloss sequence", "supersequence" or simply "sequences". In plain English, it is the geological evidence of the sea level rising and then falling, thereby depositing layers of sediment onto an area of ancient rock called a craton. Places such as the Grand Canyon are a good visual example of this, apparent in the layers deposited over time. A foreland basin is a structural basin that develops adjacent and parallel to a mountain belt. Foreland basins form because the immense mass created by crustal thickening associated with the evolution of a mountain belt causes the lithosphere to bend, by a process known as lithospheric flexure. The width and depth of the foreland basin is determined by the flexural rigidity of the underlying lithosphere, and the characteristics of the mountain belt. The foreland basin receives sediment that is eroded off the adjacent mountain belt, filling with thick sedimentary successions that thin away from the mountain belt. Foreland basins represent an endmember basin type, the other being rift basins. Space for sediments is provided by loading and downflexure to form foreland basins, in contrast to rift basins, where accommodation space is generated by lithospheric extension. In geology, a forebulge is a flexural bulge in front of a load on the lithosphere. The load causes the lithosphere to flex by depressing the plate beneath it. Because of the flexural rigidity of the lithosphere, the area around the load is uplifted by a height that is 4% of that of the depression under the load. The load and the resulting flexure place stress on the mantle, causing it to flow into the area around the loaded area. The subsidence of the area under the load and the uplift of the forebulge continue until the load is in isostatic equilibrium, a process that takes on the order of 10,000 to 20,000 years. Because of the coupling with the mantle, the rate of forebulge formation and collapse is controlled by mantle viscosity. Magmatic underplating occurs when basaltic magmas are trapped during their rise to the surface at the Mohorovičić discontinuity or within the crust. Entrapment of magmas within the crust occurs due to the difference in relative densities between the rising magma and the surrounding rock. Magmatic underplating can be responsible for thickening of the crust when the magma cools. Geophysical seismic studies utilize the differences in densities to identify underplating that occurs at depth. A river anticline is a geologic structure that is formed by the focused uplift of rock caused by high erosion rates from large rivers relative to the surrounding areas. An anticline is a fold that is concave down, whose limbs are dipping away from its axis, and whose oldest units are in the middle of the fold. These features form in a number of structural settings. In the case of river anticlines, they form due to high erosion rates, usually in orogenic settings. In a mountain building setting, like that of the Himalaya or the Andes, erosion rates are high and the river anticline's fold axis will trend parallel to a major river. When river anticlines form, they have a zone of uplift between 50-80 kilometers wide along the rivers that form them. Mountains are widely distributed across the surface of Io, the innermost large moon of Jupiter. There are about 115 named mountains; the average length is 157 km (98 mi) and the average height is 6,300 m (20,700 ft). The longest is 570 km (350 mi), and the highest is Boösaule Montes, at 17,500 metres (57,400 ft), taller than any mountain on Earth. Ionian mountains often appear as large, isolated structures; no global tectonic pattern is evident, unlike on Earth, where plate tectonics is dominant. ↑ Bradley, Dwight. “Subsidence in Late Paleozoic basins in the northern Appalachians.” Tectonics, vol. 1, issue 1, p. 107-123. February 1982. ↑ Avigad, Dov, Zohar Gvirtzman. “Late Neoproterozoic rise and fall of the northern Arabian-Nubian shield: the role of lithospheric mantle delamination and subsequent thermal subsidence.” Tectonophysics, vol 477, issues 3-4, p. 217-228. November 2009. ↑ Watts, A. B. “Isostasy and Flexture of the Lithosphere.” Department of Earth Sciences, Oxford University, Cambridge Free Press 2001. ↑ Menard, H. W. “Insular Erosion, Isostasy, and Subsidence.” Science magazine, vol. 220, p. 914-918. May 1983. ↑ Sandiford, Mike, Martin Hand, Sandra McLaren. “High geothermal gradient metamorphism during thermal subsidence.” Earth and Planetary Science Letters, volume 163, issues 1-4, p. 149-165, November 1998. ↑ Bond, Gerard, Michelle Kominz, William Devlin. “Thermal subsidence and eustasy in the Lower Paleozoic miogeocline of western North America.” Nature 306, 773-779. December 1983. ↑ Turcotte, D. L., D. C. McAdoo. “Thermal subsidence and petroleum generation in the southwestern block of the Los Angeles basin, California.” Journal of Geophysical Research, vol. 84, issue B7, p. 3460-3464. July 1979.